The Bureau of Reclamation (Reclamation) provides technical assistance to states, tribes, federal agencies, and local project sponsors in the Columbia Basin to identify and construct projects to protect and improve the survival of listed fish species. Between 2003 and 2005, Reclamation partnered with the Okanogan Conservation District to rebuild several irrigation weirs in the Methow River basin to improve fish passage while maintaining adequate water levels for irrigation diversion. Subsequent monitoring has revealed that two of the weirs on Beaver Creek (Marracci Rock Weir Diversion and the Fort Thurlow Rock Weir Complex) no longer function properly, primarily due to damage that occurred during unusually high and sustained spring 2011 peak flows. 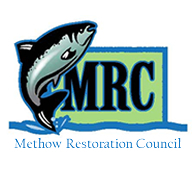 Reclamation has partnered with Methow Salmon Recovery Foundation (MSRF) to renovate the two damaged weirs to restore fish passage and irrigation intake performance. These projects are needed to repair the damaged structures and maintain and restore irrigation function and fish passage at the weirs. 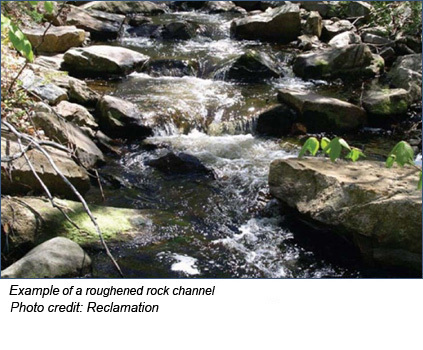 Reclamation and MSRF are proposing to dismantle the existing weirs at Marracci and Fort Thurlow and replace them with more durable roughened rock channels. These projects will involve in-stream work to move existing weir material as well as placement of additional rocks to establish an artificial riffle (small rapid). The result of this work will be a more natural looking creek bed that will provide fish passage through a wider range of flows while assuring adequate water to meet irrigation needs. These projects will reduce the need for annual instream maintenance by irrigators. This will save irrigators time and effort and limit the need for them to work in the creek bed each year. The projects will also restore and improve fish passage. At low flows, for example, the roughened channel will concentrate water to sufficient depths for adults to pass, while at high flows, juvenile fish will be helped by slower water flows at channel edges. 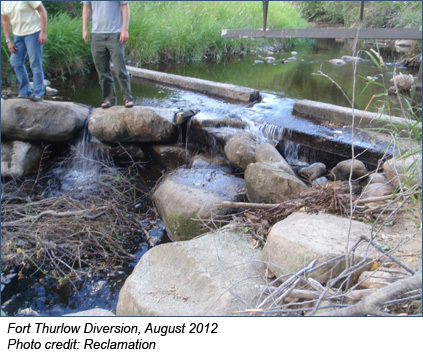 Improved fish passage will result in higher numbers of fish returning to the creek each year. Construction at the Fort Thurlow Rock Weir Complex and at the Marracci Rock Weir Diversion is planned for summer and early fall 2014. Monitoring, weed control and restoration of native plants in the disturbed riparian areas will continue for at least three years after construction.